SCALES 2 is a longitudinal follow up of the SCALES cohort focusing on social, emotional and mental health outcomes between the ages of 10 to 13 years. In Phase 2 of SCALES, we are following up the 499 children who were assessed twice in the original SCALES study. We conducted in-depth assessments of language, attention and reasoning/thinking skills with these children when they were in year 1 and year 3. We are assessing the same children when they are in years 6 and year 8. This is a critical time for our children as it covers their transition to secondary school and the onset of adolescence. 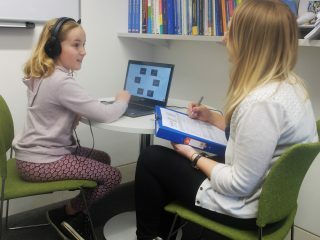 We are particularly interested in understanding the links between children’s talking skills and their future social, emotional, and mental health (SEMH). In particular we are interested in how children use their language skills to help manage their own feelings and behaviours and to help them understand the feelings and behaviours of others. 1. What explains the link between early language and later social, emotional and mental health (SEMH) outcomes? 2. Can we predict an individual’s risk for later SEMH concern based on earlier abilities? 3. Do different skills influence development of SEMH at different ages? 4. Are patterns of change in SEMH associated with particular aspects of language (e.g. knowing words for feelings, or being able to tell a story about past or future events)?